More than six months after its revolution, the North African country of Tunisia is struggling to get back on its feet. Tourism has plummeted. Tunisians have emigrated in droves. But from the industrial city of Sfax, the economy is getting a boost from an unexpected source - Libya. The sound is deafening as Nabil Triki tours his factory. In one room, machines are pumping out small rectangles of his Florida brand chewing gum. Candy production is only one part of Triki's business, which is located on the outskirts of Tunisia's southern industrial city of Sfax. The family company also processes poultry -- and business is booming for both...thanks to one particularly demanding customer: Libya. Triki says that since Libya's rebel uprising began in February, that country's industrial production has ground to a halt. He says Libyans now rely extensively on neighboring Tunisia and Egypt for their food imports. Triki says his small factory can't meet the Libyan demand. He's buying new equipment - and hiring more workers. But the Libyan conflict has had a two-fold impact. Khalil Charfi, spokesman for Tunisia's employers' union UTICA, says many Tunisian businesses have been forced to close their operations in Libya. Critical remittances have dried up as thousands of Tunisian workers headed home. And this small North African country is overwhelmed by thousands of refugees who fled Libya. All this is adding to an already tough economic situation since this country's own popular revolt in January, which ousted long-term ruler Zine El Abidine Ben Ali. Tunisians have left in droves aboard rickety boats, heading for Europe and - they hope - to a better life. Tourists - the country's economic lifeline - still shy away, fearing more unrest. Government statistics show tourism revenues dropped 50 percent in the first half of this year. As Tunisia lobbied for foreign assistance during the May G8 summit in France, Finance Minister Jalloul Ayed said getting the economy back on track is critical to consolidating its fledgling democracy. "Because if Tunisians don't feel very quickly that democracy is creating the conditions for them to feel better, to feel more prosperous, then we run the risk to see that democratic process fail in the end," he said. In the capital Tunis, the bustling old Medina is bereft of the summer-time tourists who normally pack its narrow streets. Mahmoud Abdellewi, who sells leather goods, misses them. "We need clients making a tour of the Mediterranean...France or Spain, American, English. A lot from many countries. But this time, we only have Russian people and Poland people...so we really need help, from England, from America, from Beverly Hills!" Abdellewi stated. Just outside Tunis, the whitewashed Mediterranean town of Sidi Bou Said is also unusually quiet. 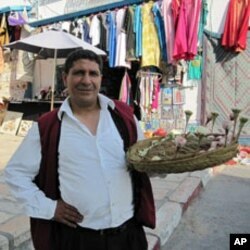 But 50-year-old jasmine seller Khmais is philosophical. Khmais says business is going slowly. But there are some tourists. And things are better since Ben Ali's departure. People are able to live and work in peace. In Sfax, many people are also guardedly upbeat. In the evenings, hundreds pack the city's annual business fair, checking out home furnishings and mobile phone offers. Fifty-three-year old Jallel Abdellewi is among them. "The business is not yet. It's not like before. But it's going to be better with the time," he said. Wissem Abdennadher, who sells water purifying products at the fair, agrees business is slowly picking up. Abdennadher says the people of Sfax are beginning to adapt to post-revolution Tunisia. Like factory owner Triki, he's seeing new demand from Libya. Both men believe Tunisian companies will bounce back - helping to reconstruct not only their own nation, but also neighboring Libya... after that popular revolt is over.